Dealing with pain can be such a terrible thing to have to go through. Day in and day out, night after night, no matter what you do nothing can take it away. When the medication or herbs are of no consequence, the position you sleep (or sit) in doesn’t matter, the surgery (or acupuncture) you have is a failure, and no matter what you say or scream to yourself, means nothing--even praying or meditating becomes a challenge--then at that point you’re willing to try anything. This is often the time people turn to something like Liangong to heal them. 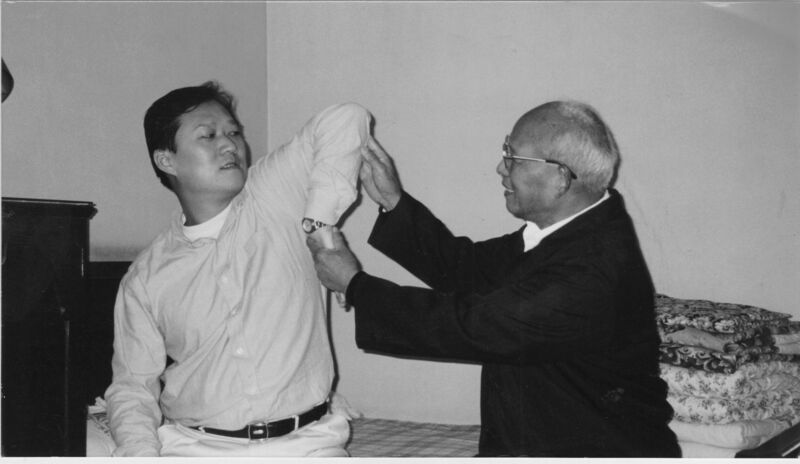 Liangong is not a cure-all, and is best utilized in the preventative or recovery stages, but like some health exercises, it can offer a way to manage pain and begin to re-educate the practitioner in how to more fully redistribute and utilize parts of their body they normally don’t or simply cannot fully use; as evidenced in the testing on patients suffering with acute pain as conducted by Dr. Zhuang Yuan Ming in 1974. So learning Liangong can be quite a process for some, yet at the same time provides relief on some level from acute pain or helps strenghten connective tissue for those seeking to manage their own health. Now when I say learning, I’m not referring to merely following the movements, as that can be easy for most people, unless they are suffering from some sort of paralysis or limited use of certain limbs, joints, or a deficiency of some sort in their connective tissue. What I’m suggesting is maximizing more of your self, by simply relaxing and releasing more stress; in order to move any part of your organism. Forcing movements to "get-them-down" can have a reverse effect and very likely compound stress. 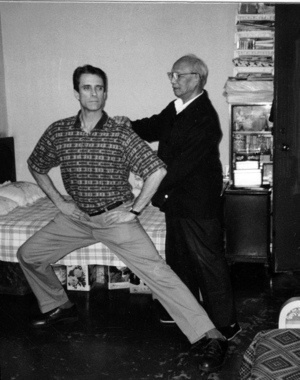 When relaxation can be incorporated into the process, then authentic learning can take place and Liangong can work more on what it’s supposed to: releasing acute pain and developing a posture that is better equipped to cope with physical and mental fatigue, as well as manage the daily aspects of aging or acute pain and injury that endlessly goes unresolved. 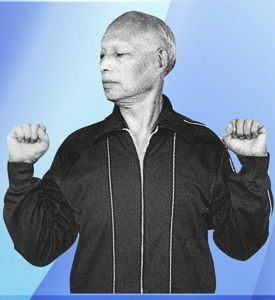 Learning Liangong is different than learning other forms of health exercise such as Chi Kung or T’ai Chi, because Liangong focuses on specific areas, as opposed to most Chi Kung and T’ai Chi styles which can be preoccupied with flowing the chi. I’m not saying that a preoccupation with chi flow is counter-productive. Flowing the chi can be very effective and powerful, but Liangong differs in that, similar to isometrics, it is more focused on isolating areas and affecting those areas with natural resistance in order to release pockets of stress or tightness or develop internal strength. 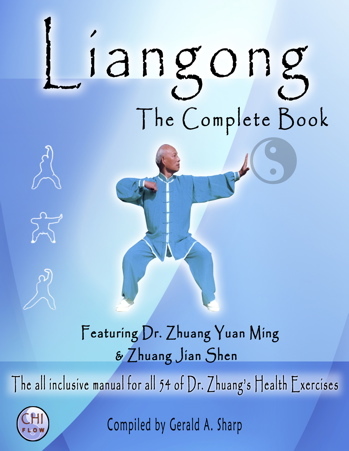 The name, "Liangong," which, when translated, simply means: "health exercise" is precisely what it is. How does anyone, especially a practitioner with acute pain, gain the most while learning Liangong? The answer is taking it slow, day-by-day. Don’t be in a rush. Realize each and every day that you will do a little more or perform a little better than you did the day before. Always relax and ease your way through the process, rather than fight your way through. A phrase which I have coined is, "Relax to move and move to relax." I base this on my studies with Dr. Zhuang who not only emphasizes precision in movement but an internal approach of ease during movement. 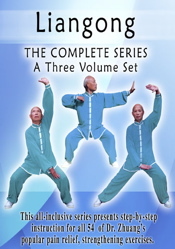 For those who have studied Chi Kung or T’ai Chi, what I'm suggesting may sound familiar. However, instead of focusing on structure and flow, shape and substance holistically, you concentrate the theory of Yin and Yang on smaller areas and points. A component approach, as it were, meant at creating dynamic effects, or results that target specific areas for release but in turn affect the whole. 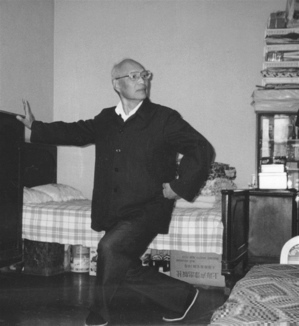 Learning Liangong then becomes a process that focuses on precision with effects both in the near and long term for it is in the exactness of movement that Liangong’s genius resides. The exactness involves an integration of posture with an awareness of a specific "target area," and the incorporation of certain movements or dynamics aimed at affecting the "target area." So when learning Liangong, it is essential to pay close attention to your posture, the target area, and to focus on integrating the two while moving into and during a particular exercise. Coordinating breathing with the movements is also essential, but instead of releasing air as is advocated in some martial arts when striking, Liangong believes in inhalation while performing the stretch; in order to have the maximum amount of air available. Also the "stretch portion" of the exercise is not preoccupied with elongation but rather a release of the target area, which is brought about through a combination of an exact shape and awareness of the target area with a lifting of the sternum and a release of the tailbone. The latter of which is performed in order to maintain a straight posture that helps to concentrate the stretch deeper into the connective tissue, rather than on larger, or more superficial areas of the practitioner’s organism. 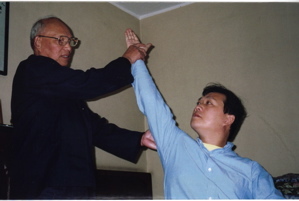 Learning Liangong is yet another way to enjoy acquiring an increased awareness of the multiple wonders of the mental and physical abilities and self-healing properties of the human organism, while at the same time benefitting from a more erect posture and increased flexibility. I remember teaching Liangong in 18 forms to a music professor some years back who was physically challenged from the waist down. The look of relief on his face while doing some of the exercises is something both of us won’t soon forget. He related how he hadn’t moved certain areas of his body for some time, and was relieved in so many ways from the entrapment of his chair. Liangong is a complete set of exercises, that allows for more specificity in stretching as well as in pain and stress management, and the process of learning it can be an extraordinary experience for a variety of ability levels. Teachers, Facilitators, Prospective Students: check out our Contacts page to see if a Liangong Instructor or Study Group is located in your area. There are also books and other information resources about Liangong. Find out more about Liangong in a 3 page on-line article. Go to the News page for information and pics from the 30th anniversary Meeting in Shanghai and Liangong world-wide. 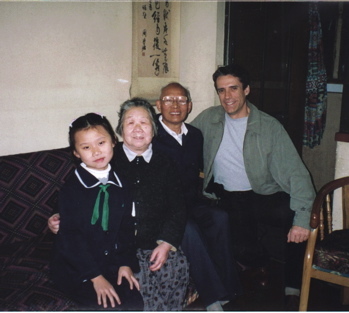 Mr. Jian Shen Zhuang, was born 1958, is the only son of Yuan Ming Zhuang - the creator of Liangong Shi Ba Fa. 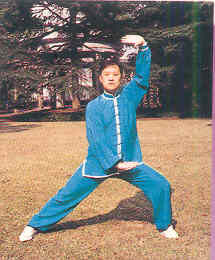 He has practiced wushu from the age of 6 years. Along with his father, he has been involved in expanding and instructing Liangong Shi Ba Fa. He has organized and judged more than 100 Liangong Shibafa Exchange competitions in China and throughout the world. He has trained a large number of the instructors, and for the precision oriented competitions: coaches and judges of Liangong Shi Ba Fa. More than 3000 foreign practitioners of Liangong Shi Ba Fa have trained with Jian Shen Zhuang in China. Since 1976, he has been Doctor-in-chief of the Shanghai China Medical (Group) Company. From 1992 to 1996, he served as both the Deputy Secretary General and the Coach-in-Chief of the Liangong Shibafa Association. 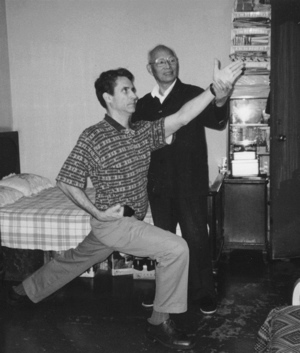 Along with his father, he is the co-author of several books on Liangong Shibafa including Liangong Yi Qi Gong. Jian Shen Zhuang speaks English and also serves as a translator. He is featured prominently on the 3 part Liangong video series. Instructors: we are setting up a directory of teachers of liangong. approval by Yuan Ming Zhuang and Jian Sheng Zhuang (and this may create delays).